Just dropping by to remind you of this “oldie but goodie” Valentine’s Day treat. It one that is easy, makes a whole bunch and everyone loves it! I’m sure many of you have made these before. But, in case this treat has slipped your mind, or, your kid tells you I need a treat for the class for tomorrow, make this! Start unwrapping the kisses. That truly is the toughest part! And, if you have to make a bunch of these for your kids, make them do it (I’m serious!). Place the pretzels on a baking sheet. 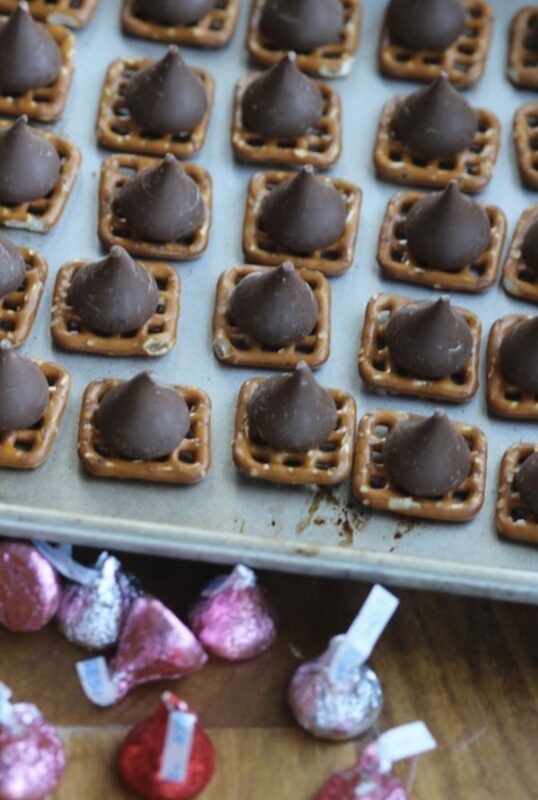 Place unwrapped Hershey’s kisses on the sheet. I usually only do about 1/2 a sheet worth at a time. About 4 minutes. Test with one M&M. If the kisses aren’t soft enough to squish down, put back in the oven for another minute or so. 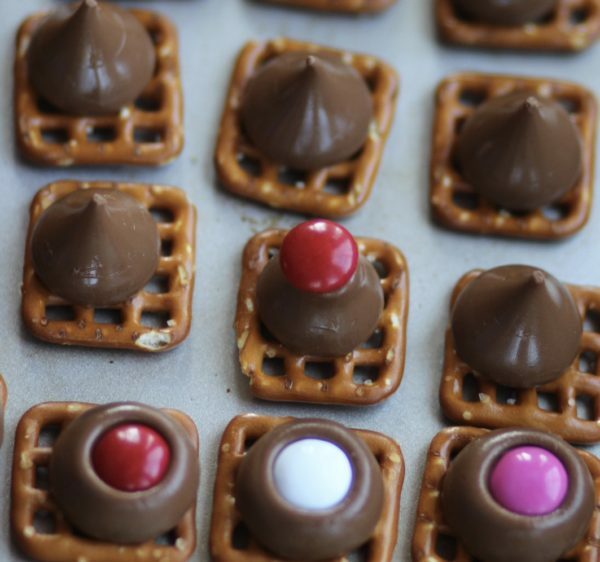 Place M&M on top of the chocolate kiss and gently press down with your finger. The three in the front have been pressed down. The red one behind is waiting to be pressed down. Place in refrigerator in a single layer until cold. I usually end up making these last minute and an hour seems to be the minimum. Eat and enjoy. The chocolate and the salt from the pretzels is the perfect combination. Have a fun Valentines Day! These look yummy and easy! Thanks for sharing!